Never quite sure about the analogy between clouds and loneliness. Dove Cottage was built in the early 17th century, beside the main road from Ambleside to the south to Keswick to the north. It was probably purpose-built as a public house, and it is first recorded as the "Dove and Olive", an inn included in a list of public houses in Westmoreland in 1617. It remained a public house, sometimes called the "Dove and Olive Branch", until it closed in 1793. 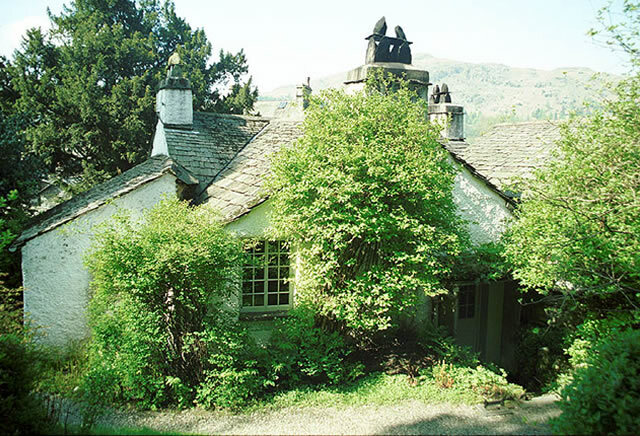 The history of the cottage is referred to in Wordsworth's 1806 poem, "The Waggoner", in which the protagonist passes by "Where once the Dove and Olive-bough offered a greeting of good ale to all who entered Grasmere Vale". The building is constructed from local stone, with limewashed walls and a slate roof. There are four rooms downstairs, and another four upstairs. The ground floor rooms retain the oak panels and slate floors often found in well-built Lakeland houses of the period, and appropriate to their original function as drinking rooms in a public house. The fireplaces were altered in the 1790s to burn coal rather than the traditional Lakeland peat. William Wordsworth had been born in Cockermouth in Cumberland in 1770, and knew the Lake District well from his childhood. He moved away to study at the University of Cambridge in 1787, and then travelled in Britain and Europe for 12 years. William first encountered Dove Cottage when on a walking tour of the Lake District with Samuel Taylor Coleridge in 1799. William had been close to his sister Dorothy in their childhood, but they had spent many years apart. Although they had lived together in Somerset in 1797 and in Germany in 1798, William wanted to find a permanent home for them together. Dove Cottage was empty and available for rent, and they took up residence on 20 December that year, paying £5 a year to John Benson of Grasmere. On the ground floor, the main reception room was the "houseplace" or "kitchen-parlour", by the main door, which contains a cooking range and window seat, used for the main daily meal. A smaller room next to the houseplace was used by the Wordsworths as Dorothy's bedroom. A separate kitchen was used for the more arduous task of the domestic routine, with the fourth room being a small buttery, used as a larder. The Wordsworths employed a neighbour, Molly Fisher, as a maid to do their washing and cooking. Upstairs, the room over the houseplace was William's study, with views over meadows to the lake, used by William for his composition and as a second parlour for light meals and entertaining. The three other rooms were used as bedrooms, with the small room over the buttery being used later as a nursery for William and Mary's children. The walls of the small bedroom were covered with newspapers in 1800 as an attempt at insulation (later removed, but copies were put back in the 1970s). There was no running water inside the house, and the toilet was also outside in the garden. William and Dorothy took particular pleasure in the garden and orchard behind the house, their "little nook of mountain-ground", which was deliberately arranged in an informal "wild" state. William became a key member of a group of Romantic poets in the Lake District, later known as the Lake Poets. Robert Southey lived in Greta Hall in nearby Keswick. Southey and Coleridge were married to sisters, Sarah and Edith Fricker, and Coleridge himself moved his family to Keswick in 1800. Both Coleridge and Southey became a frequent visitors to Dove Cottage, but Coleridge's marriage was unhappy, and he departed Keswick in 1804. Nevertheless, he returned to visit the Wordsworths in Grasmere from time to time. The Wordsworths were also visited at Dove Cottage by Walter Scott, Humphry Davy, and Charles Lamb and Mary Lamb. In later years, Thomas de Quincey became a long-term guest. Both de Quincey and Coleridge were opium users. 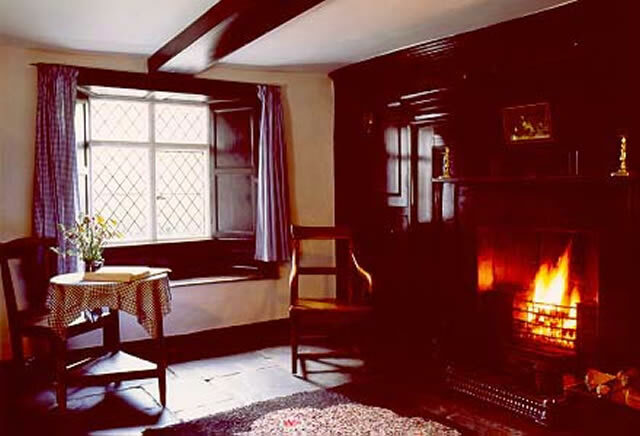 The Wordsworth Museum is next door to Dove Cottage and there you will discover the greatest collection of the Wordsworths’ letters, journals and poems in the world. Full access is available for wheelchair users to the Wordsworth Museum and Art Gallery using a combination of ramps and lifts (elevators). As Dove Cottage is an historic building, we have been unable to make provision for disabled access. However, there is a 'virtual tour' of the cottage available at the Information Point in the Wordsworth Museum. A member of the team will be happy to guide you on this tour, should you wish. Accessible lavatory facilities are available inside the Museum building and in the Jerwood Centre. Induction loops, large print guides and audio guides are available in the museum. Location : Grasmere, Ambleside LA22 9SH. Transport: Windemere (National Rail) then bus. Bus: Stagecoach 555 and 599 stop nearby. Opening Times: Daily 10:00 to 16:30. to 29th February. Opening Times: Daily 09:30 to 17:00. March to November 1st. Tickets : Adults £8.25 Students £7.25 Children Free.